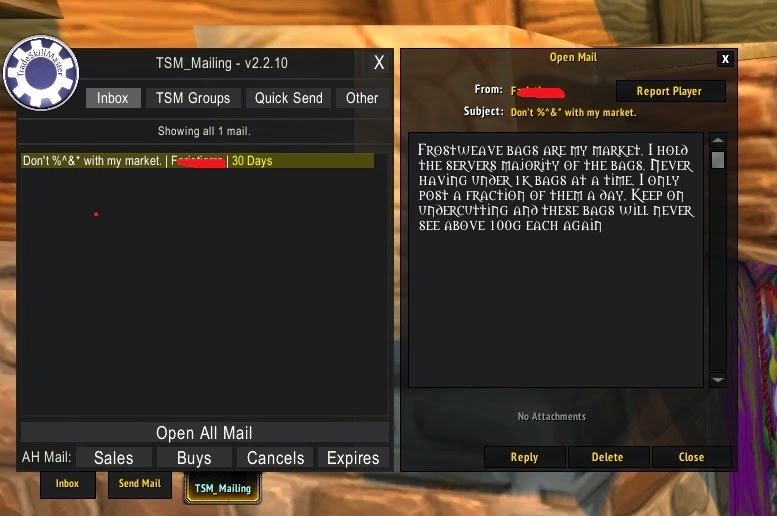 Master of World of Warcraft : Well, I should probably quit selling bags now. Well, I should probably quit selling bags now. This is why we have antitrust regulations in the real world. The big difference is that unlike most real world markets there's no barrier to entry, which means there's no lost capital when you stop, wait for the price to go back up, then start selling again. I was being camped by a 1c undercutter on belt buckles in Wrath. I refused to spend more time playing for less profit, and moved on to other stuff, but every weekend until the end of the expansion, I'd go to bed with my character crafting buckles. He started trying to buy them from me and reset the cost, but I'd always find time to craft more and bring the price back down. I'd relist a small quantity at half his inflated margin after a big reset purchase, which he'd always end up buying as well, and then I'd keep ratcheting up the quantity I'd post and the prices until he gave up and started undercutting instead. Then I'd list large quantities at low profit again. I was actually making decent money off him when he tried to set an artificially high price. I checked my addon when the next expansion launched to see how many I had been selling before and how many this guy bought from me- it was a lot. Like, 4-5 times what I'd sold before our spat, and he hadn't sold many profitably since. I never mailed or whispered him, though. I just burned the house he was trying to take from me to the ground, salted the earth, took his sister on a date, and never called her back.